My husband and I spent last weekend on Nusa Lembongan – I had been there once before but this was the first time for my husband. It is hard to describe this beautiful island. Wild waves crash over rocks sending huge white plumes of water everywhere, yet there are charming, quiet bays where one can snorkel and swim in safety. It seems to be years behind the times in so many ways – no cars, no supermarkets, no boutique shops, no easy way on and off – yet there are many modern speed boats in the busy harbour pulling shrieking tourists on every floating toy known to man, resorts and bars and a few beautiful villas perched on top of the cliffs. Without question though, the untamed beauty of the island, the people and their way of life all seem to be a flashback to another time when things were more simple and natural. Our weekend started with a half hour speed boat (and the captain did indeed believe in speed!) 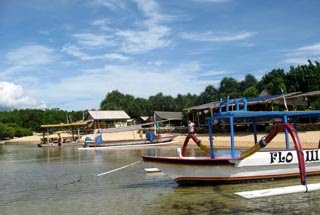 ride from Bali to Lembongan. We landed in picturesque Mushroom Bay where we were met by one of the only four wheeled vehicles on the island – an old small truck set up with two benches in the box at the back (felt a bit like being in the back of a tiny cattle truck!). But we all – 5 adults and one large dog – gamely clambered into the back of the truck with our luggage, our food, and most importantly our wine! Then we set out on a bumpy but interesting drive to Sunset Beach where our friends have a delightful cottage set on one of the most beautiful bays we have ever seen. The surf crashes on the rocks day and night and the colour of the water has to be seen to be believed – I kept removing my sunglasses to see if they were distorting the colour it was so unusual. After unpacking we explored this exquisite bay and then had a fantastic dinner complete with coq au vin, cheese cake and wine with our friends and a lovely couple they had also invited. We soon discovered that this couple had both given up successful teaching careers at a fine international school in Jakarta to move to Nusa Lembongan in order to fulfil a dream to own and run a dive school. Having lived many years in Jakarta, I can only imagine the culture shock they suffered coming from the busy, overpopulated, smoggy and constantly traffic jammed city of Jakarta to this quiet island! Hard to imagine on the one hand but hard not to envy on the other! The next morning the “boys” went out fishing while we “girls” enjoyed the sun and read our books. Although they didn’t catch any fish, the fact that at one point they had 8 (they said 12, but we all know fishermen lie!) huge manta rays surrounding their boat was worth much more than a few extra fish for dinner! We then joined the men and took a boat tour of the island culminating in a picnic lunch on the boat in the middle of an incredible mangrove forest where some of the largest mangrove trees in the world shaded us from the sun. And, of course, we then had to stop off for a drink at one of the local bar & restaurants nestled at the edge of the mangroves where I had a drink that had so much rum in it that I couldn’t drink it – yikes, when did this happen that I began to dislike a strong drink? Next we walked up to a neighbour’s villa for a swim in his pool. His villa has one of the most spectacular clifftop views anywhere in the world – it is breathtaking indeed! Then back to the cottage for a barby – is that how the Aussies spell it? Or is that the doll? Anyway, we had tender juicy steaks not leggy dolls – but sadly no fish! On Sunday morning we all piled back into the miniature cattle truck for a tour of the island. On the way, we saw a house being built where the “architect” seems not to have noticed that a very important electrical cable crossed the land so he just cut a hole in the walls both front and back and the cable runs right through the house – great ingenuity, much better than moving the wire! Highlights of the tour included seaweed farms and seaweed drying on every possible flat surface (including the road in some places), tiny homes built from recycled materials and gorgeous villas perched on the cliffs and many people swimming, snorkelling, fishing, cycling, walking and just generally enjoying their day. When we arrived back to the cottage, we walked to a nearby warung where we sat right at beachfront and enjoyed a delicious lunch. Following this, we did a bit more exploring and visiting and then packed our gear in preparation for the trip back to Bali. This time the captain still believed that full speed was best but at least the sea was reasonably calm so we all arrived back safe and sound and already missing the pounding surf and the wonderful sea air! kindly written and provided by Jane and posted by Sunset. The article is very beautifully written.The place surely promisses to be a exotic travel vacation destination. Hope i get a chance to visit this paradise on earth. 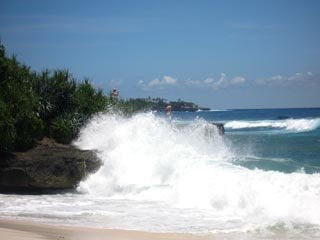 Nusa Lembongan Island lies near the popular Bali Island. The distance of the island from bali island is near about 12 miles. I read your post it is really interesting. Thanks for sharing us your trip. I wish I could be there and relax in such unspoiled surroundings watching baby turtles return to their next cycle in the sea. Nusa Lembongan seems perfect for recapturing your strength and peace of mind. Just wondering what types of accommodation are really on offer there. 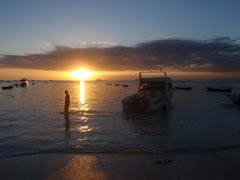 Or could one perhaps hire a tent or a trailer to sleep in at night and find little local inns with local food to enjoy? Hi sunset, interesting blog & good post. overall You have beautifully maintained it, you must submit your site for free in this website which really helps to increase your traffic. hope u have a wonderful day & awaiting for more new post. Keep Blogging!